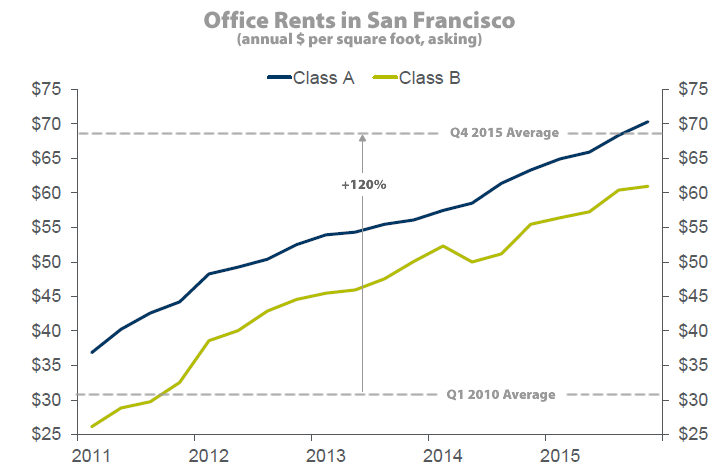 The average asking rent for office space in San Francisco hit a record high of $68.14 per square foot at the end of 2015, surpassing the dot-com record of $66.00 per square foot set in the fourth quarter of 2000 by 3.2 percent. And at 5.9 percent, the current office vacancy rate is the lowest in over 15 years, but still will above the historic 1.3 percent rate recorded in the second quarter of 2000, according to Cushman & Wakefield. Having jumped 5.2 percent from the second to third quarter of 2015, the acceleration of rents slowed in the fourth quarter, having only increased 2.1 percent from the quarter before. But office rents in the city have increased over 15 percent over the past year and have more than doubled since a post-recession low of around $31 per square foot in the first quarter of 2010. The amount of leased but vacant space that’s available for sublease currently measures around 730,000 square feet, which represents 16 percent of the 4.5 million square feet of currently available space on the market. And of the 7 million square feet of office space that is currently under construction or entitled for development in San Francisco, roughly 1.5 million square feet will be delivered in the first half of 2016, all but 4 percent of which has been pre-leased, including LinkedIn’s 450,000 square foot building at 222 Second Street. Might be useful – or at least interesting – to see rents people/firms are actually paying now: presumably only a few % comes on the market each year so 80-90% (or whatever) are currently paying rates that must be only half (or less) of current asking. Not that any anything bad could come of this scenario, of course. You can get that information from this chart. Companies that signed leases in 2011 are paying roughly $40/sf for Class A space (maybe slightly higher if the lease included provisions for annual increases). Those that signed in 2012 are paying roughly $50. Etc. Yes you can infer a lot, if, for example you assume everyone signs five-year leases and hence one fifth of space comes on line each year, etc. ; but I was trying not to put so many assumptions into it…some might sign for seven or (even) ten years, some might sell their buildlng(s) and begin leasing instead. etc. How does this assume that everyone signs five year leases? If one signed in 2011 for a 5-year term, 10-year, or 20-year, one is still paying roughly the $40/sf reflected on the chart (again, with perhaps some periodic adjustment). Nothing more complicated than that. But perhaps I’m missing something. The issue is how much comes on line each year – and implicitly how much is still locked-in under earlier, presumably lower rates. If everyone signed one-year leases, then it would be no one, if everyone signed 20 year, then 3/4 are still in 2011 (or earlier) rates. The editor’s comment below suggests a turnover of about 1/12, which means a lot are 10-year (or longer) and a big portion of the market – 2/3?? 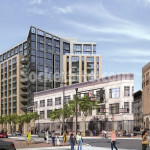 – is still paying those $35/sf prices. Notcom…it also depend how much of the market is leased space. 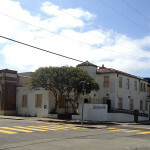 Not sure if the editiors total “existing office space” is only leased space or does it include owned space. Roughly 6.3 million square feet of space was leased in 2015, which represents an above average turnover of roughly 8 percent of the existing office space in the city. This makes my $52/sq ft apartment seem like a bargain! I assume the 5.5 million feet entitled or under construction includes HP’s 3 million sq feet and the Giant’s project?